Pinoy and Proud of It! Yes, it’s official! 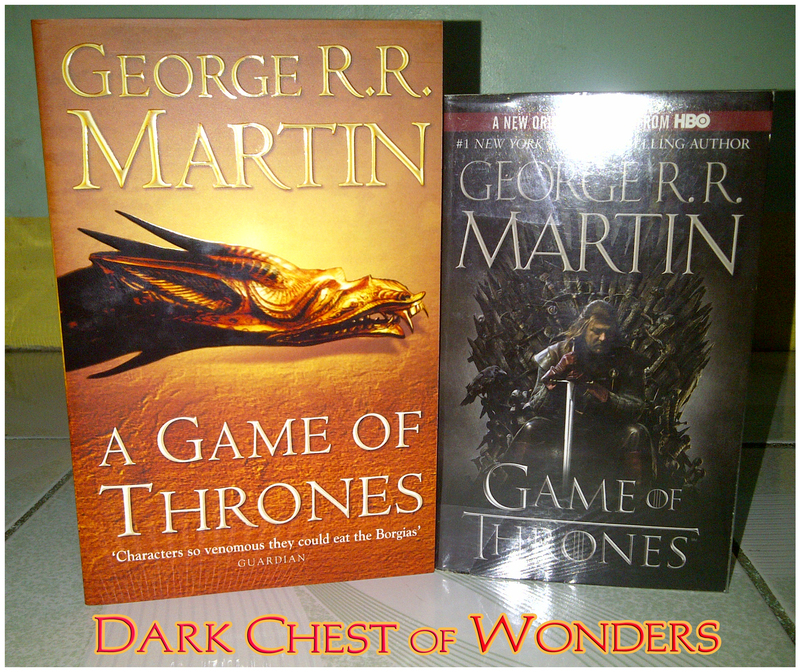 I’m jumping the George R. R. Martin bandwagon! 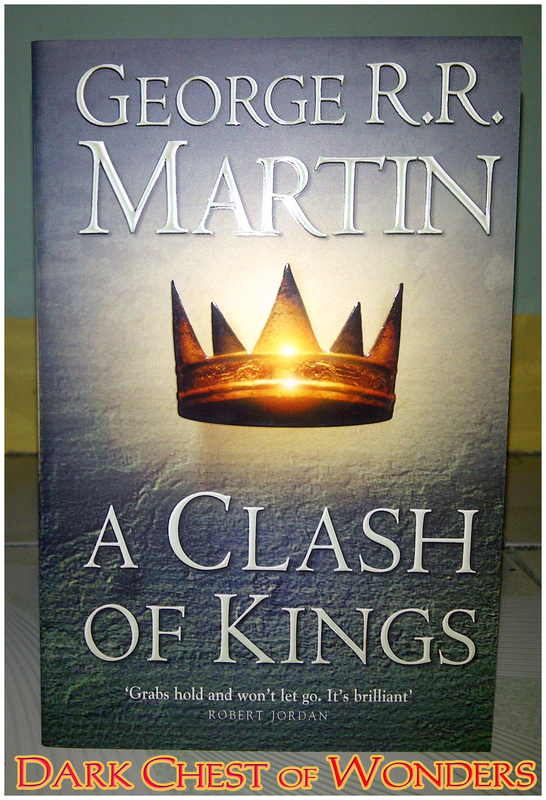 Since HBO aired the first season of the TV series Game of Thrones to wide acclaim, people have just been raving mad about how good it was — and so was the book it was based upon written by George R. R. Martin, A Game of Thrones, the first book in the epic called A Song of Ice and Fire. 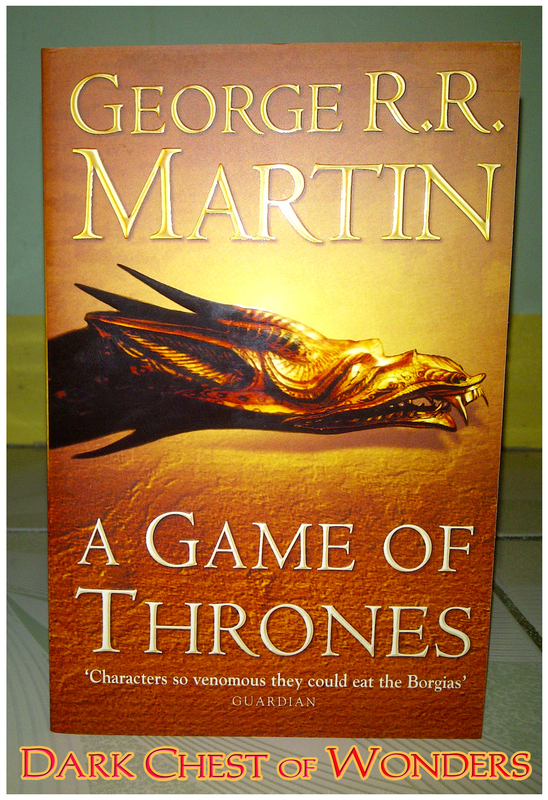 Learning to approach things that come with hype with caution, I was not too keen both to the TV series and the book — that is, until friends and book blogs I follow began praising how good it really is. As for me, that’s all the persuasion I need (see how easily gullible I am). From the get go I was bent on getting the whole series thinking that buying the boxed set will be a good deal if ever the fantasy series does interest me. Actually, I was bent on getting the Bantam boxed set — since it’s the only kind I see — on the 32nd Manila International Book Fair. 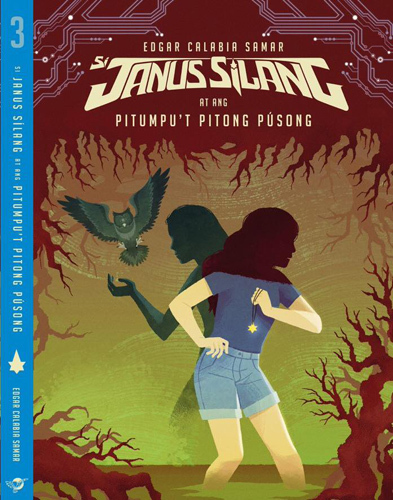 However, the set was sold out on my second round in MIBF during the weekend. I let it at that believing that new deliveries will soon arrive and I then have to wait for another sale. When it’s meant for you, it is for you. As fate would have it I am meant for something better. 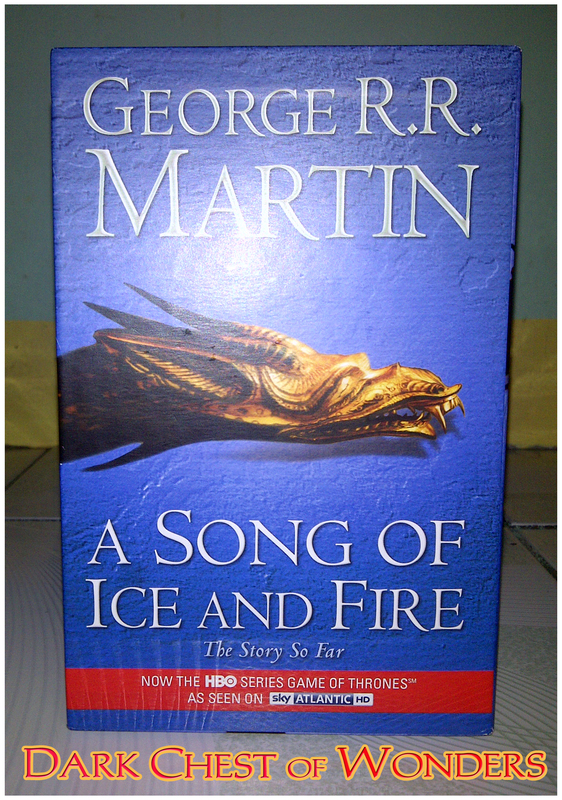 So it is that upon seeing the UK boxed set edition of A Song of Ice and Fire published by Harper Voyager (the recent July 12, 2011 printing coinciding with the release of the fifth book, A Dance with Dragons) for the first time on Fully Booked Gateway, I decided then and there that it is the one I want. 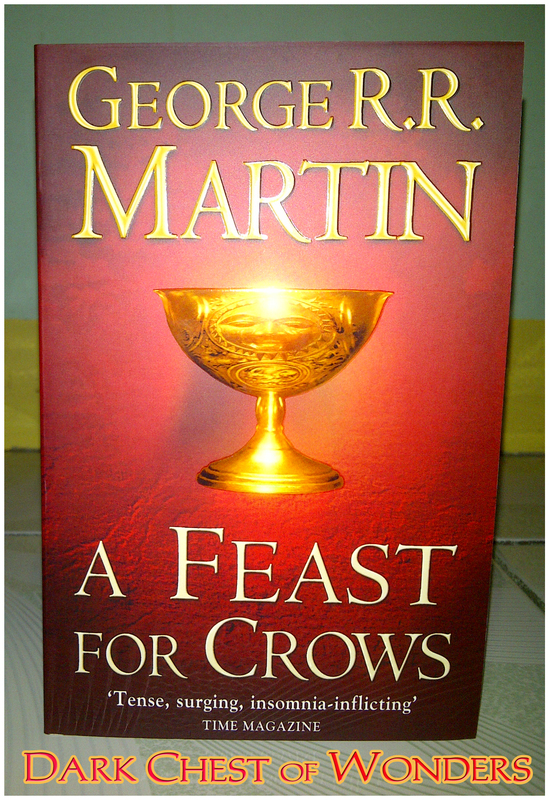 Yet I hesitated on the weeks that followed mulling over if it’s well worth it as it is steeply priced at Php 2,199. I just overcame my indecision when I receive an email notification from the said bookstore that their Gateway branch is having a 20 % off sale for 3 days (Dec. 2-4). I took this as a sign, and so on Saturday the previous weekend I went to the bookshop, made the purchase that will definitely bloat my TBR pile yet walked off a happy man. Below are the pictures I took of the UK boxed set edition. Ogle, Gentle Readers! Top view of the box. Back view of the box. 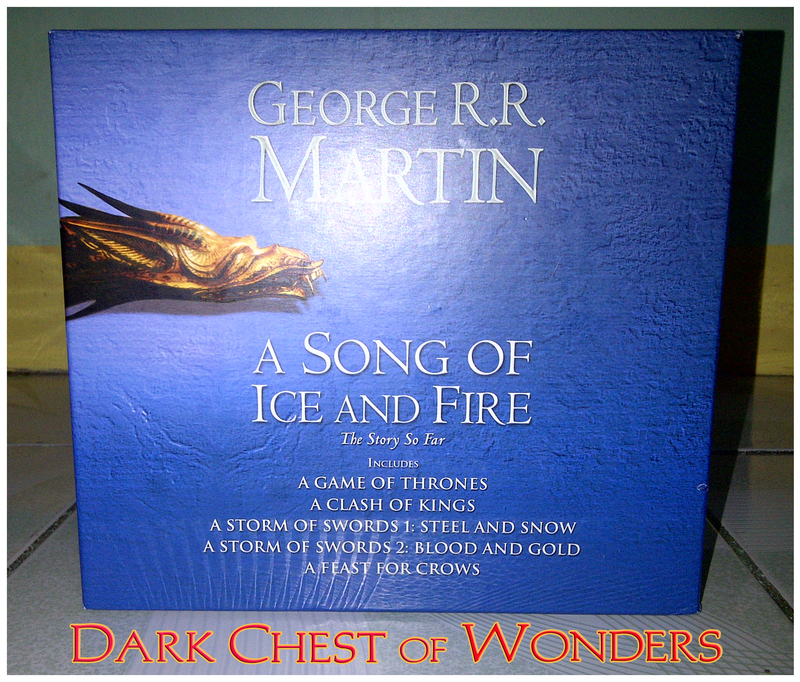 Front view of the box and the books included in the set. Here’s the individual pictures of the books included in the set. In case you’re wondering, the UK edition comes in B Format (with the dimensions: 5.12″ x 7.8″) Paperback size and pictured here is slightly larger than the Bantam Mass Market Paperback edition. Here’s an overview of the books included in the set. As you see the boxed set also comes with a free companion guide, but this should not be browsed especially by those, who like me, are just starting to read the series as it contains major spoilers. The 4 page map at the rear of the companion might come in handy though. 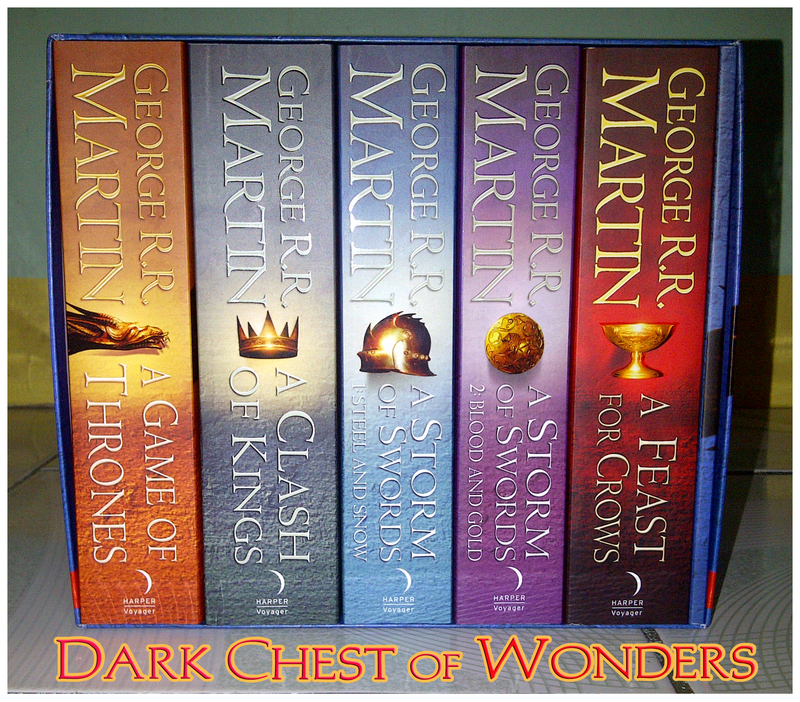 I think this boxed set is a good value for your money and it’s also a nice gift idea for someone who likes to read fantasy epics or a little something of a Christmas treat for yourself. If you’re a nitpicking book collector like me and shies away from movie tie-in editions, this might be the one you’re looking for. Considering the individual price for the individual books, this one’s definitely a good deal, more so if you can have it at a cut-off sale price like I did. So don’t think twice, get this one right away before it runs out. As I hear the second season of the TV series is now on production and will air early next year, so you can still catch up. Looks like someone’s got a lot of reading to do. Winter is coming! Oooh *DROOLS* Of course, any sight of books just makes me drool. 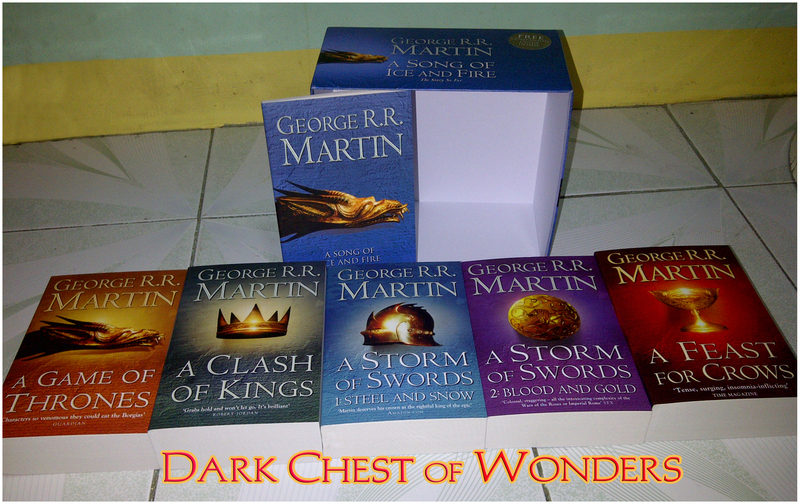 I am interested with this series, too but I’m not yet sure if I should buy the entire set. Maybe I’ll try the first book first, then let’s see if I like it enough to buy the sequels. Yes, I think that’s a good move to see first if this one will interest you. Not that everyone’s talking about means it’ your cup of tea, eh? Yup, the third book is THAT long. As I researched, the UK publisher really want to divide the third book into two parts. I think it has something to do with the binding and the font size issue. welcome aboard 🙂 Don’t forget to buy A Dance with Dragons. Of course, I will not. I hope the paperback for the fifth book will be available next year. WHAAAT?? I didn’t expect you to jump in so soon. Oh well, I guess I have to eat all the dust of the speedy wagon, hahaha. Thank you for commenting, Angus! what a gorgeous set! my copies are all mismatched and manhandled from being read so many times. 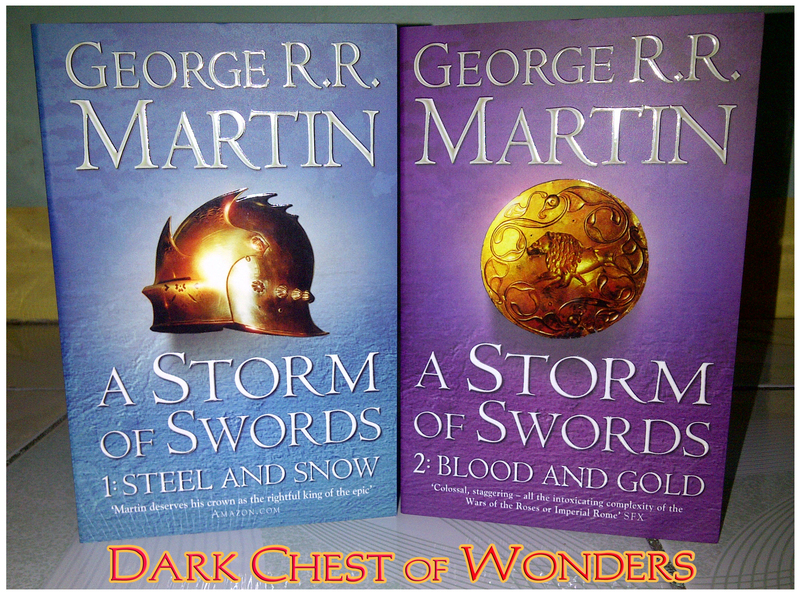 Can I tell you how happy I am that they split Storm of Swords? because even as a paperback it is a MONSTER all in one volume. they are quick and addictive reads, so enjoy! It’s a gorgeous set, indeed! The UK tends to divide very thick books when they’re printed in “mass market” format. They did that for Sanderson’s “The Way of Kings” as well, which is why I really searched for the UK Trade PB ed. so that I can get it as just one book. If only God gave me more money last month, I might order a trade paperback edition of the book. Thanks for the info Meann, I thought the series only available in MMP. I’m an eedjit! Haha. 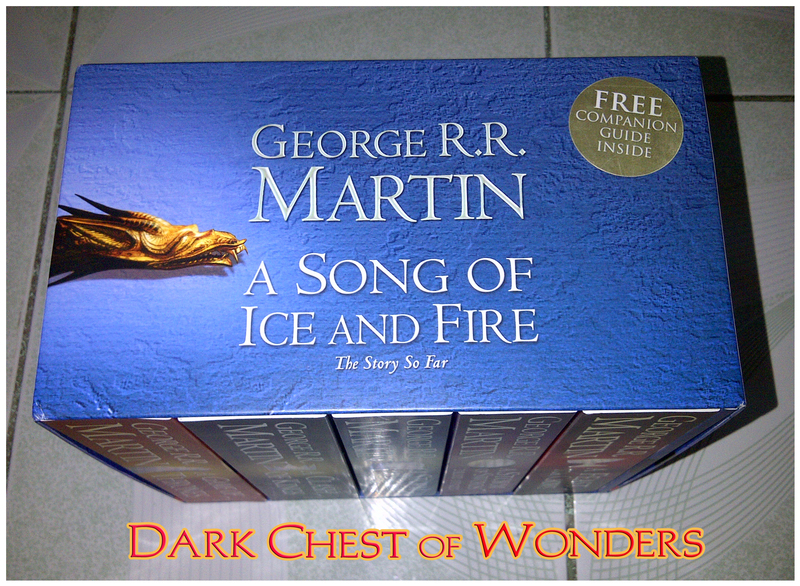 I want the box set too and I wish they are going to release a hardbound edition of the box set. Kidding. Are trade paperback edition available in box set? The UK editions are in Trade Paperback format, I think. Thanks friend and thanks for the blog visit. Please never mind the gayness of my blog. It looks like my blog is run by a girl than a guy like me. I’ll explain it further later next year and don’t judge the book by it’s cover but I’m quite defensive with this kind of issue. Niyahaha. Happy New Year friend! Do you have the ISBN number for this boxed set? Also, do you happen to know the height of the books? Do you happen to have the ISBN number for this specific set? Hi, I’m jzhunagev! Reading books is my life and I have always been entranced by the power of words. I love the pull of a good, well-drawn story, regardless for what age it is written for; no matter what genre it belongs; whether it’s fiction or not; whether it’s written in ink on paper or pixels on screen, or as a limerick. If it reaches for utter humanity, in jest or in earnest, I’m going to like it. 2010-2017 © Dark Chest of Wonders - jzhunagev. All Rights Reserved. No content or images on this blog site may be used without the permission of jzhunagev and/or the respective image owners.